There are times when I have fallen out of love or infatuation with a project, I refer to it as becoming disenchanted with something. 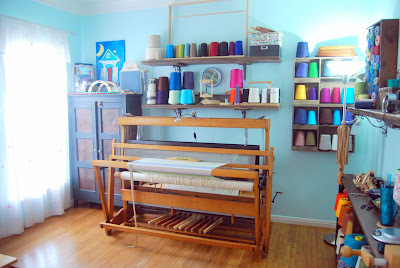 At the moment, I have two projects on the knitting needles and three different sets of tea towels on three separate floor looms. I am obsessed with ALL of them! This is a problem because I can only work on one thing at a time. 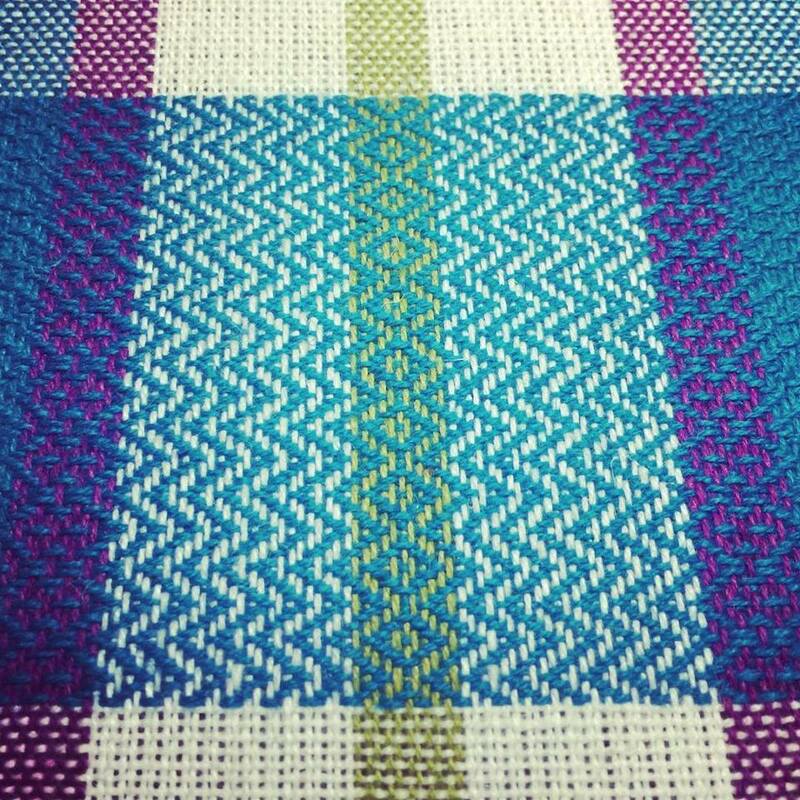 The weaving aside, I have been dividing my time between a lace weight shawl with BEADS and a sport weight Fair Isle sweater. 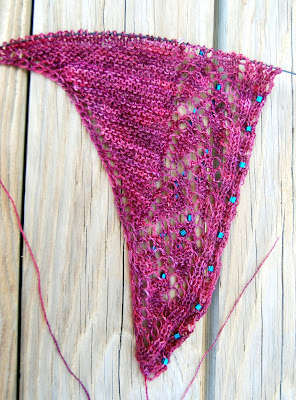 The shawl was cast on last night. 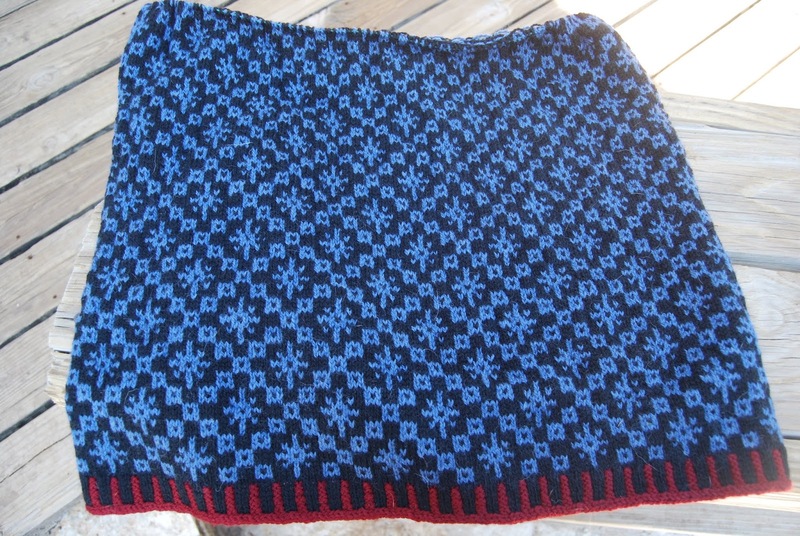 Also, once I read through the pattern, I saw where the edge design called for bobbles. I generally like bobbles and have no issue knitting them, but with the change in yarn weight, I thought I would dress it up a bit bit beads, instead. Unfortunately, the bobbles are made in a line of purl stitches, which face the front. 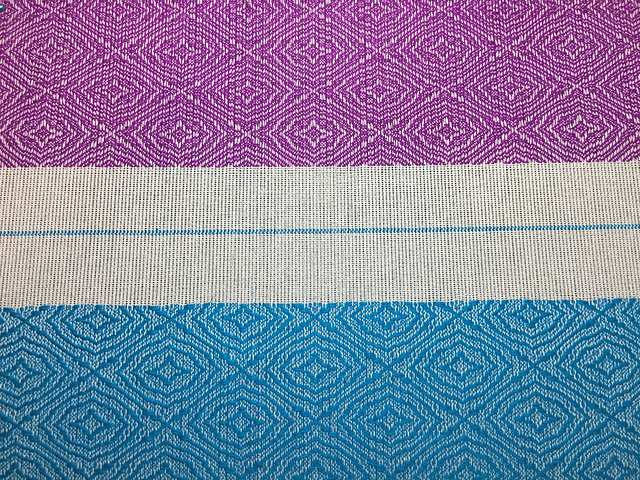 When substituting beads, the beads showed up on the back side of the fabric. They still looked good, just not from the front. 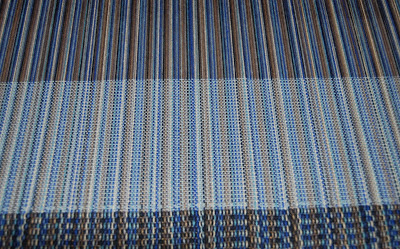 This is a shot from the wrong side of the fabric, the line of beads runs down the right hand side of the fabric. Beads on the backside did not bother me at all, as I found them kind of funky and cool. So, I decided to keep them; however, I still wanted some bling on the front side of the fabric. 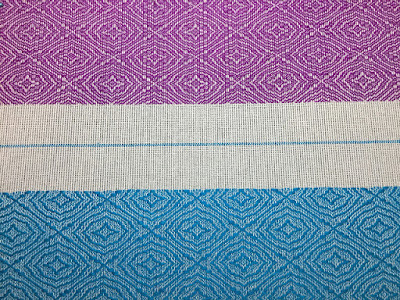 Studying the lace chart, I decided I would incorporate them at the cdd (central double decrease) stitches. As I had missed a handful of opportunities to add the beads, I frogged what I had done and cast on a second time. Normally, when I add beads, I use a tiny crochet hook or a fleegle beader. I add the bead to the live stitch on the left hand needle immediately before I knit that stitch. 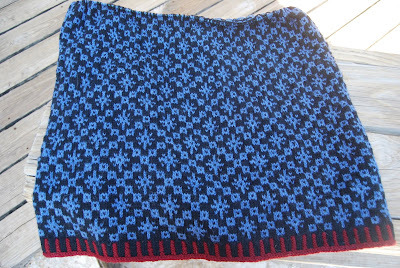 To replace the bobble, this is what I did; however, with the cdd, it did not work well to add the bead prior to knitting the stitch and slipping the two slipped stitches over everything. So, what I have been doing is completing the cdd first, then adding the bead to the completed stitch on the right hand needle. It has worked beautifully! The yarn is Dream in Color Wisp in Sangria, a glorious combination of 50% silk and 50% merino. I bought two skeins from Webs a couple of years ago. They had one skein left in the same color, and I ordered it. Each skein is 550 yards, but since I am using a tighter gauge than recommended in the pattern, I wanted to make sure I had enough yarn for the size I want. The beads are from Bead Fusion. They are 4 mm Toho cube beads. The other project demanding my attention is the Oa by Kate Davies. I actually started this project at the end of October. 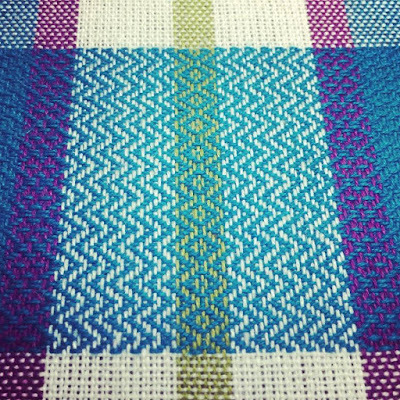 While I adore Fair Isle, there are lot of stitches to knit in the round. 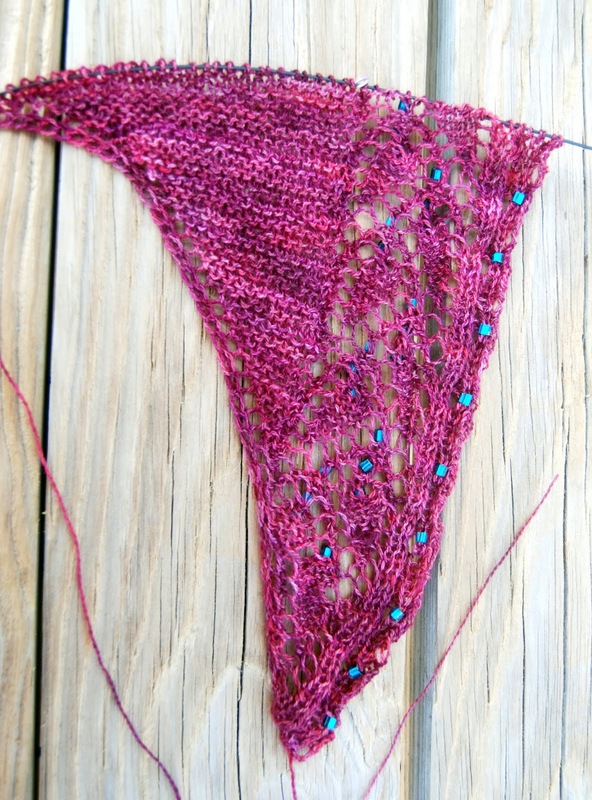 I have picked it up and slogged along with it here and there, but there has been no dedicated stitching, until I decided I wanted to knit the shawl and had to wait a week and a half for my beads to arrive. Weird how that happens. I am within four rows to complete the length of the body (both front and back) to divide for the arm holes. At that point, I will have to put the body down and knit both sleeves before I can continue. That's actually kind of exciting! I was hoping to be at that point before the beads arrived, but they came a day early. For those who have knit this pattern, they will notice the bottom hem has already been done. Yeah. I could not wait. I wanted to see how the colors worked together. This sweater was provisionally cast on at the bottom and worked up toward the arm holes. The provisional stitches are then released and captured onto the needles for the hem to be knitted. To check my tension and see how well it would lie flat, I also steamed the bottom four inches (only four inches because that was how much I actually had knitted at the time). It was obviously a go from that point on. Since I cast on, I have decided that this will not ultimately be a pullover, but a cardigan. While I did not do steeking stitches in the middle of the front, when the time comes, I will isolate the line of stitches to be cut, reinforce the stitches on either side, then slice the whole thing open! When I finally get to that part, I will definitely take photos. Heck, I may even do a video! 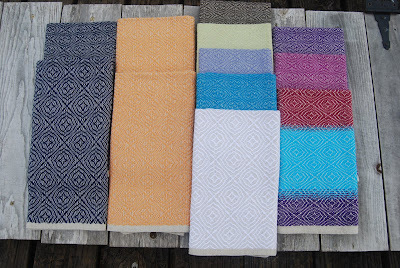 In weaving news, these are the three sets of tea towels on each of the floor looms. One last thing, I came across this post on Knitty for a sett checker. It is kind of like a wip tool, but has individual slots to test the sett for a specific yarn/thread. It has slots for setts of 8, 10, and 12. I am not sure why I thought I needed one, but I bought one anyway. Purl & Loop in Houston has them.